While the 1984 Mustang's 20th Anniversary did not include a major design change as some expected, some subtle additions to the Ford Mustang's styling was made, as well as significant engineering, performance options and engine choices. It was also the first year of the new EEC-1V engine control system. diagnostics (OBD), but also examine and potentially modify the operation of computer controlled parts such as fuel injectors and engine timing on the new 1984 Mustang. One of the two big highlights in the 1984 model year was Ford's introduction a a new model called the "SVO". Available as a 3-door only. Road and Track at the time, said it "may be the best all around car for the enthusiast driver ever produced by the U.S. industry." It's appeal to enthusiasts and pundits stemmed not from one specific feature of the vehicle, such as it's newer, stronger 2.3 liter turbocharged 4 cylinder engine, or it's bigger, larger aluminum wheels and bigger tires. It was probably the first, completely thought out and executed overall performance package since the 1969 Boss 302. Engine characteristics were mated precisely to drivetrain, suspension modifications and overall dynamics. It featured variable assist power rack and pinion steering, at the front and a traction-loc differential with a 3/45:1 ratio, 4 link suspension at the rear and fully adjustable Koni shocks to maximize handling and road manners. Cornering power was surprising, with a very sticky 0.8 G. And with 11.08 inch power assisted vented discs at the front and 11.6 inch vented disc brakes at the rear, braking was only 137 feet from 60-0 mph. Overall styling for the 1984 Mustang changed little on these cars, except for a new performance offering from the SVO (special vehicle operations ) division of ford. The base, or standard 1984 Ford Mustang L, was both the price leader and the fuel economy leader for the pony car line. With it's thrifty 2.3 liter 4 cylinder engine, which had received some "massaging" the previous year, the little motor delivered a very satisfying 21 mpg city and 33 mph highway. It also became the base for a very exciting high performance option from Ford's SVO (Special Vehicles Operation) department. More on that later. 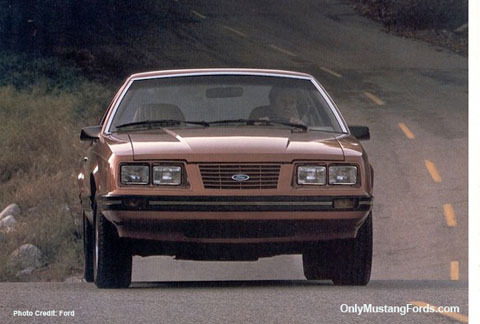 The1984 pony cars arrived with a new, more aerodynamic, closed off nose area, replacing the standard egg crate grille area, and a recessed license plate cavity in the front bumper, giving it a decidedly euro look. These turbo gt's were also visually distinctive with their unique hood scoops. 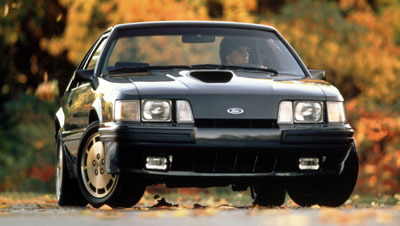 Standard turbos still had the reversed hood scoop from 1983. 20th anniversary Mustang celebration,with red, side body striping, reminiscent of the original G.T.350 stripes from the 1960's Shelby. The exterior color was, similar to its predecessor with Oxford white as the only choice. 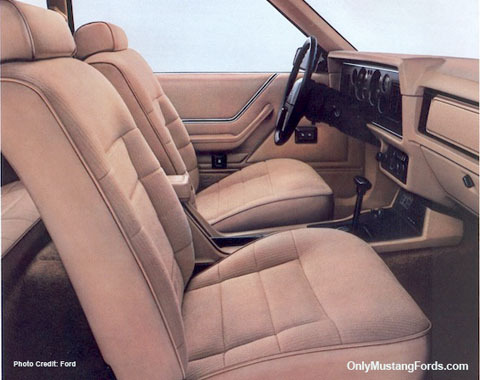 The standard and 1984 Mustang GT interiors went relatively unchanged while the GT350 package was available in one choice only, with the canyon red interior. Tho only other change, was the 20th anniversary plaque on the front dash. The SVO was powered by a hot hod version of the 2.3 liter 4 cylinder turbo charged motor, they kicked up the boost and managed to wring out 175 horsepower to the rear wheels. The 20th anniversary car, was available with 3 engine choices. A 5.0 Liter 4 barrel V8, matched to a 5 speed transmission, a 5.0 Liter throttle body ( Central fuel injection ) engine, twinned to the automatic and the 2.3 liter inline 4 cylinder with sequential fuel injection and turbocharger. The 4 barrel V8's produced 175 horsepower,while the fuel injected motors had 165 hp. 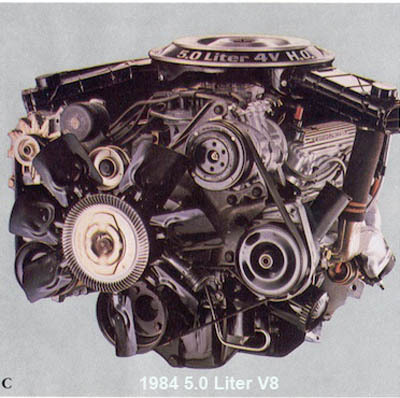 The standard 2.4 liter turbo HO motor continued to produce 145 hp. Transmission choices, being the AOD,or automatic overdrive transmission, and the previous year's Borg-Warner T5, five speed manual transmission. The first Saleen Mustang rolled off the line in 1984, well three to be exact, but it was the start of something good! Check out the Saleen Mustang section for more info. Here's a handy search box to get you to the information you need.